Karan Johar has posted a selfie on social media. It’s not a regular selfie but the one with the country’s PM, Narendra Modi. 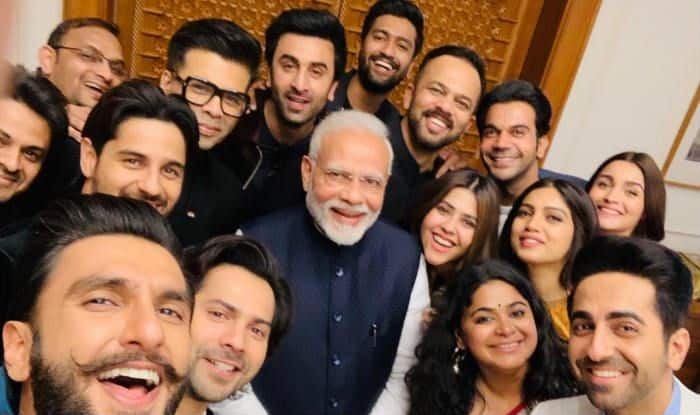 The filmmaker, along with a few prominent actors of the new generation from Hindi film industry, went to meet PM earlier today, on January 10. The caption on the photo sums up the reason behind the meeting. Thanking PM Modi and highlighting the industry’s responsibility to produce good content for the society, Karan wrote, “Powerful and timely conversations can bring about change and this was one of what we hope will become a regular conversation. Meeting the Honorable Prime Minister @narendramodi today was an incredible opportunity”. The caption further read, “As a community, there is a huge interest to contribute to nation building. There is so much that we want to do. And can do and this dialogue was towards how and what ways we can do that. When the youngest country (in demography) joins hands with the largest movie industry in the world, we hope to be a force to reckon with. Together we would love to inspire and ignite positive changes to a transformative India. The actors who accompanied Karan at the meeting were Ranbir Kapoor, Ranveer Singh, Alia Bhatt, Bhumi Pednekar, Ayushmann Khurrana, Vicky Kaushal, Rajkummar Rao, Sidharth Malhotra, and Varun Dhawan. The group also included filmmakers Rohit Shetty, Ashwini Iyer Tiwari, and Ekta Kapoor. Talking about the basic agenda behind the meeting, a source close to India.com said, “It’s majorly about discussing the participation and contribution of these youth icons towards nation building”.